Mantra that released in 2007 had a very fresh story line with a new treatment at that time. It was successful in delivering those horror punches with a great timing. Apart from the treatment of the story, Shivaji’s performance also was special. Posing as a horror film but ending with a psychological touch was novel at that time. Now Mantra 2 tries to follow that template mixed with Anukokunda Oka Roju-ish moments. 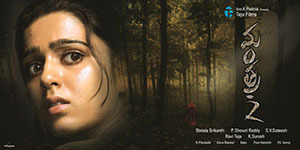 The movie begins in Vizag where Mantra (Charmee) has nightmares. She moves to Hyderabad after getting a job as programmer. She joins as a paying guest in the house of Rama Rao (Tanikella Bharani). Rama Rao and his wife have a big villa and a big heart. Mantra is an orphan. The old couple and Mantra bond too quickly with a forced sentimental background music. Whenever Mantra is outside home, murder attempts are made to kill Mantra, but she escapes every time. In Hyderabad, she also meets her old college buddy who is an ACP now. She seeks his help from him and when he starts investigating, spooky events follow. The first five minutes of the film promise a minimum guarantee horror movie in the next two hours. And these first five minutes takes place in the dream of Mantra. When Mantra gets up from sleep, reality begins. The reality is that movie is an absolute disaster from then. The movie is induced with tones of clichéd dialogues and predictable thrills. There are déjà vu moments within the film itself. Most of the scenes can be easily guessed. This lack of novelty affected the film very badly. To add to the mediocrity of the script, the director made the actors dramatize many scenes. A great actor like Tanikella was made to deliver some crappiest lines and they look so superficial. The characters overact and sometimes overreact. The scenes between Charmee and the Tanikella couple are ridiculous and so are the scenes of the male lead’s family. The icing on this rotten cake is a silly comedy track having Venu Tillu. To make the second half equally annoying the writer created a gay character and tries to evoke senseless humour. Charmee’s performance was very ordinary, but the male lead was better. Apart from the lackluster script and screenplay, there are many logical flaws that are so obvious. For instance, there is a scene where Charmee gets into an auto and he takes her through a dark route. When she screams and asks to stop. The driver is unperturbed. He looks back when she pats him. He puts an earphone and talks to her. Yes, earphones are the new hearing aids in the town. In the very next shot he converses normally with her without his earphone on. Oops the hearing machine. Technically also the film falters badly. The background score is so redundant and unappealing. There are loud high tension sounds even when the visuals are casual. The camera work is ordinary too with some grainy shots in the dark scenes. They also included an insipid item song, probably hoping for a hit like the Mantra’s ‘Maha Maha’. Mantra 2 – Too Mundane : Overall, Mantra 2 doesnt have even half the impact of Mantra.